The bestselling author of This Is Where I Leave You returns with a hilarious and heart-rending tale about one family's struggle to reconnect. You don’t have to look very hard at Drew Silver to see that mistakes have been made. His fleeting fame as the drummer for a one-hit wonder rock band is nearly a decade behind him. He lives in the Versailles, an apartment building filled almost exclusively with divorced men like him, and makes a living playing in wedding bands. His ex-wife, Denise, is about to marry a guy Silver can’t quite bring himself to hate. And his Princeton-bound teenage daughter Casey has just confided in him that she’s pregnant—because Silver is the one she cares least about letting down. So when he learns that his heart requires emergency, lifesaving surgery, Silver makes the radical decision to refuse the operation, choosing instead to use what little time he has left to repair his relationship with Casey, become a better man, and live in the moment, even if that moment isn't destined to last very long. As his exasperated family looks on, Silver grapples with the ultimate question of whether or not his own life is worth saving. With the wedding looming and both Silver and Casey in crisis, this broken family struggles to come together, only to risk damaging each other even more. One Last Thing Before I Go is Jonathan Tropper at his funny, insightful, heartbreaking best. 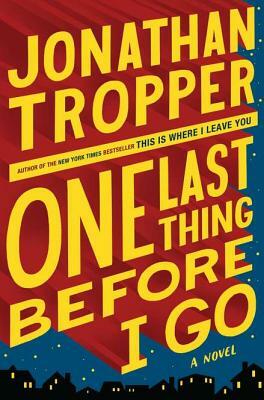 Jonathan Tropper is the New York Times bestselling author of five previous novels; Plan B, The Book of Joe, Everything Changes, How To Talk to a Widower, and This Is Where I Leave You. His books have been translated into over twenty languages. He is also a screenwriter, and the co-creator and executive producer of the HBO/Cinemax television show Banshee, premiering in 2013.